A 10-month-old boy was referred to our department for hoarseness and joint contractures. His birth weight was 2,760 g. His parents realized hoarseness and limb contractures when he was 2 months old. Subcutaneous nodules were realized when he was 4 months old. He was the second child of non-consanguineous parents. There was no family history of a similar disease. He was referred to our department when he was 10 month old. He weighed 4,880 g and was 67 cm length with a head circumference of 40.5 cm. He was interactive. But he had head lag and axial hypotonia, fish mouth, joint contractures and subcutaneous nodules located on fingers, back and knee [Figure 1] and [Figure 2]. His vital parameters and general physical examination were within normal limits. Ophthalmologic examination was normal. Blood cell count, erythrocyte sedimentation rate, C-reactive protein, biochemical parameters, cranial magnetic resonance imaging (MRI), and abdominal ultrasound were all normal. Extensive metabolic screening was negative. Biopsy of the nodular swelling revealed highly cellular tissue with scattered large foamy cells in deep dermis and fibrosis. Ceramidase level estimation and genetic studies could not be done. Typical clinical presentation and histopathologic findings in the above case clinched the diagnosis of Farber's disease. Farber's disease is a lysosomal storage disease which was first described by Farber (1957). 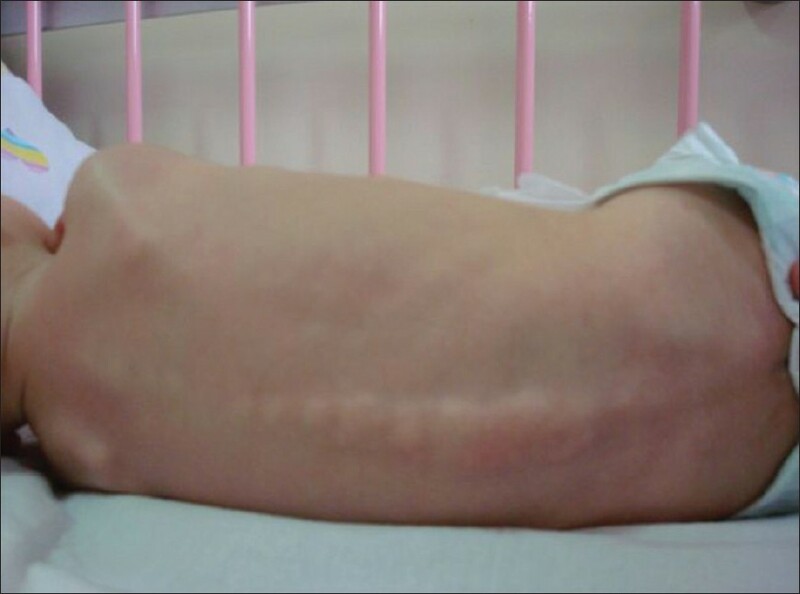 It is an autosomal recessive disorder caused by lysosomal acid ceramidase deficiency. Acid ceramidase is an enzyme that in humans is encoded by the ASAH1 gene. , Normally, the enzyme ceramidase breaks down fatty material in the body's cells. In Farber's Disease, the gene responsible for making this enzyme is mutated. Ceramidase level estimation and genetic studies can be done for diagnosis. But we diagnosed Farber's disease with typical clinical presentation and histopathologic findings in our case. 1. Farber S, Cohen J, Uzman LL. Lipogranulomatosis; A new lipo-glycoprotein storage disease. J Mt Sinai Hosp N Y 1957;24:816-37. 2. Moser HW, Linke T, Fensom AH, Levade T, Sandhoff K. Acid ceramidase deficiency: Farber lipogranulomatosis. In: Scriver CR, editor. Metabolic and Molecular Bases of Inherited Disease. New York: McGraw-Hill; 2001. p. 3573-85. 3. Bernardo K, Levran O, Koch J, Gärtner S, Li CM, Quintern LE, et al. Molecular cloning and characterization of a full-length complementary DNA encoding human acid ceramidase. Identification of the first molecular lesion causing Farber disease. J Biol Chem 1996;271:33110-5. 4. Li CM, Park JH, He X, Levy B, Chen F, Arai K, et al. The human acid ceramidase gene (ASAH): Structure, chromosomal location, mutation analysis, and expression. Genomics 1999;62:223-31. 5. Ehlert K, Frosch M, Fehse N, Zander A, Roth J, Vormoor J. Farber disease: Clinical presentation, pathogenesis and a new approach to treatment. Pediatr Rheumatol Online J 2007;5:15.